The CP Group, headquartered in San Diego, CA, is reintroducing the McMRF™. The McMRF™ is designed to handle, process, and separate single stream materials at approximately 10TPH. The CP Group has owned the trademark on the McMRF™ for years, and inherited the name when CP Manufacturing bought out Count Recycling in 2000. The McMRF™ was designed to process only containers when it was originally engineered. The CP Group has re-engineered the system for single stream materials, realizing the need for smaller sort systems in small communities that do not need a full-scale MRF, and still receive the benefits of a larger system- high quality machinery, recovery rates and material quality. The McMRF™ is an affordable compact solution that can fit into a 20,000 square foot building with a 95-98% recovery rate. It is an energy efficient system optimized to operate with just a compact wheel loader and a forklift. “The McMRF™ is modular in design with field-proven equipment and our latest advances in machinery. It is easy to operate and delivers the best material separation,” John Kemp, Director of Field Services, CP Group of Companies. Many smaller communities transport waste and recyclables out of their towns; this system now gives them the option to keep it within their towns, creating an opportunity for business while decreasing transportation costs. The CP Group of companies consists of CP Manufacturing, Krause Manufacturing, MSS, IPS Balers and Advanced MRF. The CP Group is a global leader in the design, build and installation of Material Recovery Facilities for various applications. 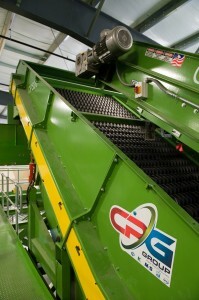 For more info please visit www.theCPgrp.com or http://www.cpmfg.com/recycling-equipment/recycling-sorting-systems/mcmrf/ .